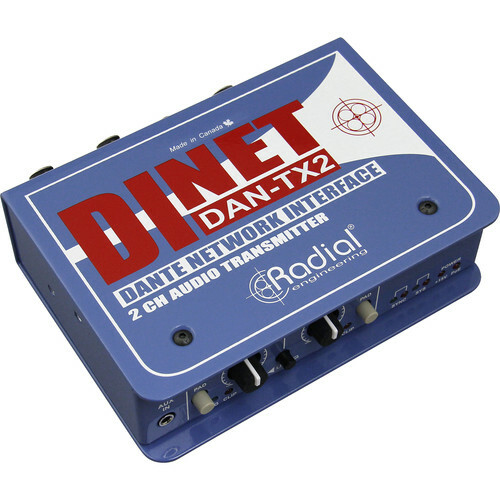 Conveniently route a stereo analog line-level source into your Dante or AES67 audio network with the Radial Engineering DiNET DAN-TX2, a compact two-channel Dante network transmitter designed for use in live sound, broadcast, and high-tech studio productions. The DAN-TX2 offers linkable trim controls and -18 dB pads for simple management of your gain stage, and a host of LEDs for indication of signal status, power, sync, and more. Connect a balanced line-level signal from a mixer or audio interface to the XLR-1/4” combo jacks, or hook up an unbalanced source, such as a CD player or mobile device, to the RCA or 3.5mm inputs. The built-in, high-resolution A/D converter outputs Dante-/AES67-compliant digital signal at up to 24-bit / 96 kHz resolution to the locking etherCON jack, allowing easy integration into your audio network. The DiNET DAN-TX2 features a powder-coated, 14-gauge steel enclosure for rugged durability and tour-worthy dependability. Power can be supplied via the included 15 VDC power supply or PoE (Power over Ethernet). Box Dimensions (LxWxH) 11.8 x 4.9 x 2.7"